1. Nerves. Public speaking is a frightening prospect for most people. Talking about self so overtly should be a challenge for believers. Therefore nerves are normal. While everyone in the audience will understand that the person feels nervous, this doesn’t change the fact that nerves can lead to losing track of the story, or saying something that is not intended, or to shifting into teaching rather than giving testimony, or to losing all awareness of time. To stand and give a crafted testimony in a set time without reading a script takes the skill of a preacher. 3. Instructing. So many good testimonies become awkward because the person feels some compulsion to instruct the listeners. Where the story of God at work is so powerful, the pointed finger and some generalized imperatives are awkwardly blunt. Once someone drifts into unplanned teaching they can make theological errors, assume something they don’t understand yet is unexplainable, make promises that their experience is how God always works, or whatever. It can be a minefield. And yet, despite all that can go wrong, testimonies can be so powerful. Why? 1. They can stir worship. Isn’t God amazing? What a wonderful story of His faithfulness and persistent love! 2. They can generate hope. I am not the only one who struggles like that, and they have seen God bring change, maybe there is hope for me? 3. They can foster understanding. I had no idea they had gone through all that. I am so glad they are now part of the family and God is still at work. 4. They can unite the church family. I used to struggle with that person, but now I know their story I can actually celebrate God’s goodness instead of feeling so bothered by their quirks. 5. They can convict unbelievers. Where you were, that is where I am … I need to respond to God’s convicting work in my life. And so much more. Testimonies can have such impact, either positively, or negatively! Next time I will explain how we incorporate testimonies in our church – it might be helpful. This morning I was sat in a coffee shop a few hundred miles from my home country. Behind me there were six or seven elderly men in highly animated conversation. By highly animated I mean literally shouting over each other and gesticulating wildly. They were not in a conflict, they were in a normal Saturday morning conversation. Just like the men shouting over each other in the coffee bar, so also the men shouting over each other in these church tensions … all are very much playing out their own cultural norms. In the case of the church issues, some of those norms are cultural as per their country, while other norms are sub-cultural as per their denomination. 1. Casting Vision – The big church together biblical preaching slot is probably the main time that most people are together during the week. Consequently the leadership functions of the church can be offered in a unique and biblically grounded way during the preaching. If your church divorces leadership from preaching, it will suffer for it. But when a church feels led more by the Bible than by a personality, health can be generated. 2. Creating Atmosphere – Lots of other ministries are massively significant in the life of the church. Small group ministries, age-specific ministries, one-to-one discipleship, mentoring and counseling ministries, evangelism in many forms, etc. But all of these can happen more effectively in the space and atmosphere created by the Sunday preaching of the church. 3. Offering Gratitude – Lots of other ministries can easily go unnoticed. Investing in children in the nursery or children’s programs, one-to-one ministries, practical work – setting up church, maintaining the building, etc. The preaching is a good place to lift up other ministries of the church so that people know the preacher doesn’t buy the hype that can so easily be assumed of the pulpit ministry. 4. Providing Vocabulary – An effective illustration or thought through wording can become vocabulary for the church. Recently I used an illustration of living in our thimble while Jesus has an ocean perspective – there may be some “thimble” conversations going on as a result. Sometimes even just offering permission to start a conversation, for instance, “I may be completely misunderstanding this situation, but the preacher on Sunday encouraged us to use him as an excuse for coming and raising it with each other, so here’s my ‘help me understand you on this little thing’ . . .” Big church preaching can prompt the one-to-one conversations that need to happen in a church community. 5. Building Unity – Churches are filled with humans and humans bring their lifelong saturation in the brine of Fallenness along with them. So people distrust people. Ministries will easily compete with ministries. The preaching is an opportunity for the wise preacher to let God’s Word build unity and trust within a church by offering both vulnerability and vision. 6. 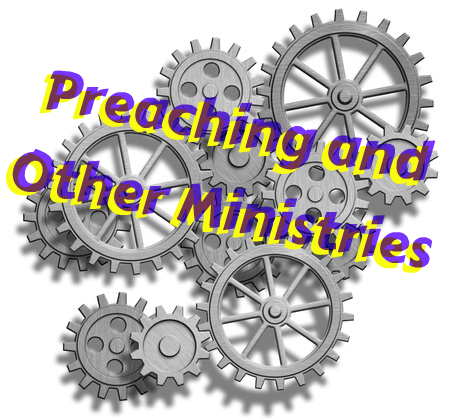 Co-Labored Stirring – The preaching can and should co-labor with other ministries. It may be that a sermon unlocks an apparently unresponsive individual, or offers new hope to an apparently committed-to-drift couple, etc. Then it may be another ministry that continues the work toward fruitful life change. 7. Setting Example – Probably this is already covered implicitly, but let’s be overt: the preaching can set the tone for other ministries . . . i.e. submission to the Word, honoring others above ourselves, vulnerability, tenderness, courage, etc. Can the church leadership ask others to minister in a way that the pulpit does not demonstrate? Preaching is important, but it is not the only ministry of the church. Does your preaching support and strengthen the ministries of the church? Or does it inadvertently undermine and compete? 1. Be mastered by a book. Whether you regularly preach through whole books or not, make sure you spend enough time soaking in a book that it can truly grip you. Be saturated so that when squeezed, you ooze the content of that book. Then prepare a series to invite others into that blessing. 2. Invite others into the preparation process. 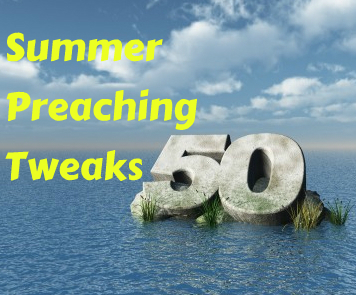 We all tend to go solo on preaching preparation. Invite some folks to join you. Perhaps in a group, perhaps a series of conversations, perhaps ask for help on facebook or twitter. Perhaps talk through the message, perhaps ask for help on support material, perhaps find out where others think the points of tension lie. It will probably be better together. 3. Lean less on your notes. If you are a manuscript reader, take only an outline. If you are a notes user, experiment with note-less. Be as prepared as you can, but make the message simpler in structure, stick in a passage and run through it several times. Going noteless is not as hard as you think, and the benefits might mean you never go back! 4. Stay put, dig deeper. If you are a concordance freestyler, try preaching a message where you stay put. You will find that you will tend to dig deeper in the passage and apply more fully in the present. Both are good things! Only cross-reference if there is a genuine need to do so. 5. Craft the main idea a little bit more. Take an hour at some point and work on the main idea of the message for an hour more than you normally would. How can it be more precise, more memorable, more relevant, more text specific, more encouraging, less wordy, less historic, less theologically phrased?